Hotel Giorgione, a Romantic 4-star Hotel is situated in the most authentic and lively part of Venice, in a historic and peaceful location, just a few minutes' walk from the Rialto Bridge and St. Mark's Square. The charm of Venetian history, tradition and hospitality are guaranteed by the family that has always owned it. The satisfaction of our guests and attention to their needs is fundamental in our aim of becoming their home in Venice. This is our concept of hospitality. For our guests' exclusive use, the ancient internal courtyard with its emotional pool is a place to relax and regenerate. The ideal place in summer, for an lovely breakfast or an unforgettable evening by candlelight. The hotel's 4-star services are complemented by the hospitality of experienced multilingual staff, who are always happy to reveal the wonders of Venice, booking excursions and guided tours, suggesting traditional or alternative itineraries and providing valuable advice to discover the lesser-known corners of the city. The Venetian “Altana” is a typical type of roof-terrace, a wooden structure resting on the roofs. It’s an out of this world, exclusive place, though not exactly a terrace, but a structure made for the sun, the wind and open space. From a confectionery warehouse to an inn, it then became an elegant 4-star historical residence. 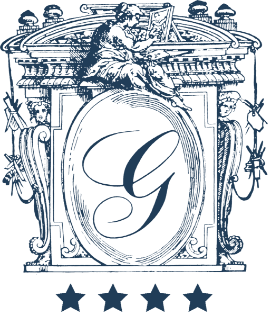 Staying at the Hotel Giorgione means experiencing Venetian history that is centuries old. Hotel Giorgione enjoys the most strategic position on the island of Venice, near Saint Mark's Square and the Rialto Bridge, and conveniently situated for connections by public transport. The waterbus stop "Ca' D'Oro" on the Grand Canal is just 300 metres from the hotel, with line 1 for all connections on the island. Also 300 metres from the Hotel Giorgione is the "Fondamenta Nuove" waterbus stop, with all connections to the islands of the Venetian Lagoon: Murano, Burano, Torcello and Lido and the Alilaguna Service to and from Venice's Marco Polo Airport. The Santa Lucia train station can be reached in 15 minutes by foot. St. Mark's Square is a pleasant 10-minute walk away from Hotel Giorgione, through narrow streets and squares, featuring both elegant and traditional shops and boutiques. Always the heart of religious belief and once, also the centre of the Serenissima authority (the ancient Republic of Venice), St. Mark's Square is as ever an emotional experience. St. Mark’s Basilica, framed by the porticoes of the Procuratie, and St. Mark’s Basin, the marvellous fifth perspective between the Doge’s Palace and the Libreria Marciana (National Library of St Mark's), are one of the world's most spectacular sights. In just 5 minutes from the hotel you can reach the Rialto Bridge, the lively commercial heart of Venice, with its typical goldsmith's and souvenir shops under the arches. At the foot of the bridge stands the colourful fruit and vegetable market and fish market. The Cannaregio District is so called because it overlooks the Regio Canal, the last stretch that connects the Grand Canal to St. Mark's Basin and the Lagoon. The Hotel Giorgione is situated near some of the city's artistic and historical treasures, less known and frequented than others, but no less fascinating and charming: Venice Casino, is housed in the Cà Vendramin Calergi, an example of the finest 16th century civil architecture in Venice, and is also home to the Wagner Museum (the famous German composer who lived and died here in 1883); the Church of "Santa Maria dei Miracoli", a delightful Renaissance treasure of multicoloured marble; the Jesuits' Church, to whose order Pope Francis belongs, with works by Titian and Jacopo Tintoretto; the oldest Jewish ghetto in Europe with 5 synagogues and a Jewish museum; the “Ca' d'Oro”, one of the most beautiful buildings on the Grand Canal; and adjacent to the hotel is the Church of the Holy Apostles, with works by Giambattista Tiepolo and Sebastiano Santi. Luxuriously decorated Gothic palace dating back to the 10th century, formerly the seat of the Doge (Head of State of the Venetian Republic) and the Venetian magistrates. Today it houses the Civic Museum with exhibitions and tours of the Doge's rooms, the armoury and the prisons. Located in the district of San Marco, it is one of the most important and representative museums of the city of Venice. The various sections and rich collections illustrate the art and civilisation of the city.